Please note, Upper Deck has cancelled 2013 Fleer Retro Baseball. 2013 Fleer Retro Baseball marks Upper Deck's return to the diamond under a new MLBPA license. Bringing back several Fleer-branded inserts, primarily from the 1990s, the high-end release is a kick of nostalgia for many long-time collectors. 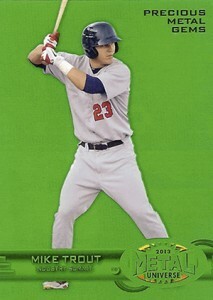 The 2013 Fleer Retro Baseball base set consists of 100 cards. They are split evenly between 1960 and 1961 Fleer Greats. Every other pack also has a 1992 Fleer Rookie Sensations card. 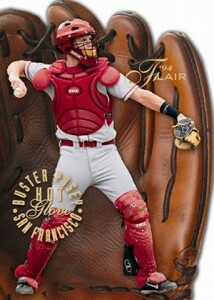 Because Upper Deck has a license with the MLBPA and not MLB, images do not use uniforms or MLB logos. Instead Upper Deck will rely on photo shoot images and college shots. Every 2013 Fleer Retro Baseball hobby box has a total of six autographs. Leading the way are Autographics and Fresh Ink designs inspired by 1999 and 2000 designs. 2000 Fleer College Greats of the Game Autographs pictures signers in their varsity gear. Player ink is also found on parallels from the 1960 Fleer Greats and 1961 Fleer Greats, and 1992 Fleer Rookie Sensations sets. 2013 Fleer Retro Baseball marks the first time the Retro brand has memorabilia cards. Approximately every other box has a Feel the Game card that look similar to those found in 2000 Fleer Mystique. Gary � Your eyes do not deceive you. I understand UD wants to stick around baseball without a license but this…this is not the way to do it. Why are the inserts all 1:90 or greater? Wow. Fleer Retro works for basketball. This baseball just does not look good! I think its cool UD is attempting a retro set, but these retro styles (fleer metal, flair hot gloves) are sets that collectors would rather forget. Fleer should focus on early styles and the 2000 GOTG which are popular with collectors. Actually, I really like the set. It is different from the normal. It could be better but it could be worse. Looks like a solid set.